The development of an advanced fuel is enabling the design and deployment of new high temperature gas cooled reactors worldwide. China is a technology leader in this area. However, work is also taking place in the US and Canada. South Africa is taking a second look at its PBMR design. The unit is scheduled to begin operating later this year. The first of the graphite spheres was loaded within the reactor’s core on April 5. Work on two demonstration HTR-PM units at China Huaneng Group’s Shidaowan site near Weihai city in China’s Shandong province, began in December 2012. The plant will initially comprise twin HTR-PM reactor modules driving a single 210 MWe steam turbine. A proposal to construct two 600 MWe HTR plants – each featuring three twin reactor and turbine units – at Ruijin city in China’s Jiangxi province passed a preliminary feasibility review in early 2015. The design of the Ruijin HTRs is based on the smaller Shidaowan demonstration HTR-PM. Construction of the Ruijin reactors is expected to start next year, with grid connection in 2021. China has been actively promoting its HTR technology overseas and has already signed agreements with other countries – including Saudi Arabia, South Africa and the UAE – to consider the construction of HTGR plants. Last August, China Nuclear Energy Engineering Group signed an agreement with Indonesia’s National Atomic Energy Agency (Batan) to jointly develop an HTGR in Indonesia. (WNN) Each of the graphite spheres for the HTR-PM is 60 millimeters in diameter and weighs about 0.192 kilograms. Every fuel element contains 7 grams of heavy metal. The enrichment of U-235 is 8.5%. The uranium kernels – about 0.5mm in diameter – are coated by three layers of pyro-carbon and one layer of silicon carbon. The coated fuel particles are dispersed in matrix graphite of pyrolytic carbon PyC which is 5cm in diameter. Surrounding the fuel-containing graphite matrix is a 5mm thick graphite layer. The reactor cavity will be filled with a total of 245,318 fuel elements, to a depth of over 11 meters. In 2005, a prototyping fuel-production facility was constructed at the Institute for Nuclear and New Energy Technology with an annual capacity of 100,000 fuel elements. In an innovative partnership tiny X-Energy, a start-up, has teamed with one of America’s biggest nuclear utilities, Southern Co., to collaborate on the development and commercialization of the design of a high temperature gas-cooled reactor. X Energy, LLC (X-energy) announced March 16 that it has commenced the conceptual design phase for its Xe-100 high temperature gas-cooled (HTGR) pebble bed modular reactor. The company also welcomes Clint Medlock, a Southern Nuclear employee, as Program Management Consultant. X-energy held a Conceptual Design Readiness Review on March 8 to validate the baseline design parameters, preparatory documentation, analysis tools, scope of the proposed conceptual design phase (including all planned deliverables), management processes and overall team readiness to proceed on to the next phase of Xe-100 reactor development. An external panel comprised of industry experts from Southern Nuclear, Burns & McDonnell, and Technology Insights was engaged to evaluate X-energy’s preparedness to enter the conceptual design phase. As part of the conceptual design, X-energy and Southern Nuclear deepened their relationship by engaging Clint Medlock on X-energy’s Xe-100 development team as Program Management Consultant. Medlock, a 12-year Southern Nuclear veteran, has 27 years’ nuclear industry experience and has managed several large nuclear design and construction projects. “I am excited to have Clint as part of our X-energy leadership team. His nuclear experience, input, and guidance has and will continue to be invaluable,” said Ghaffarian. “We value our partnership with Southern Nuclear as we move through conceptual design and look towards deployment.” In August 2016, Southern Nuclear and X-energy entered into a Memorandum of Understanding as a step toward commercializing and deploying the Xe-100. Neither Southern nor X-Energy explained in their press statements in August 2016 where their R&D work intersects. The technological link between the two projects is Triso fuel. 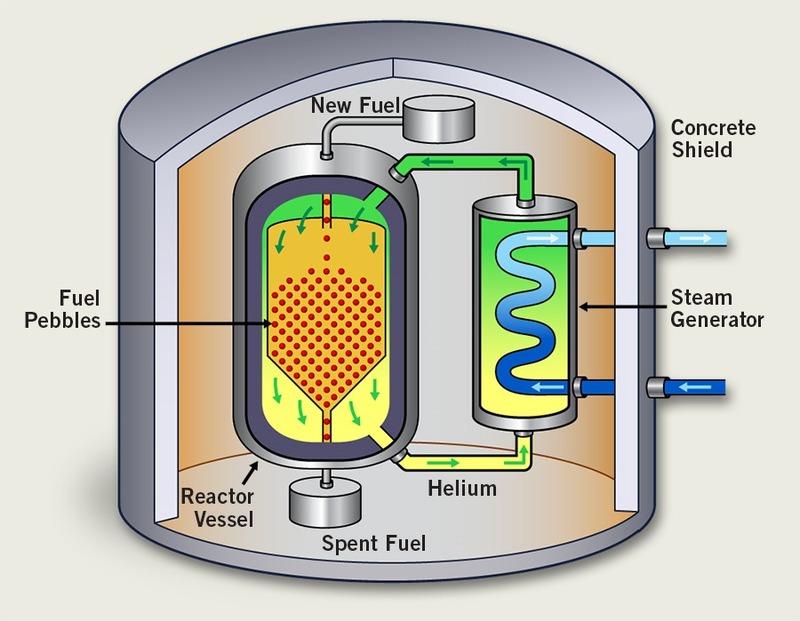 Some GEN IV designs of very high temperature molten salt reactors specify the use of it. The pebble bed design depends entirely on Triso fuel. According to a 2013 report by World Nuclear News, research teams at two US national laboratories ORNL, INL) have found that irradiated carbon-coated Triso fuel particles are even more resistant to extreme temperatures than previously thought, offering potential benefits for reactor safety. TRISO fuel developed and tested at the Idaho National Laboratory was enriched to just over 9% U235. The pebble bed and molten salt designs share another characteristic, and that is both have a negative temperature coefficient that automatically shuts down the reactor if temperatures get too high. The Integral Fast Reactor, a sodium cooled design, also has this safety feature. 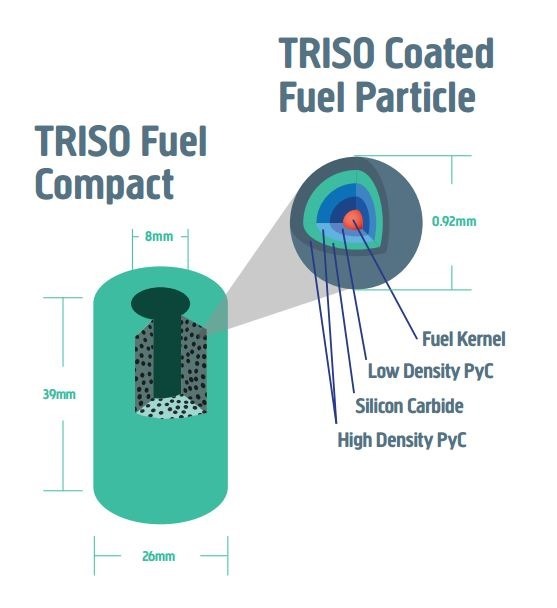 The structure and spherical shape of TRISO fuel means that it maintains its integrity under extreme heat conditions. TRISO fuel was originally developed in the 1980s and is currently being manufactured in the USA. 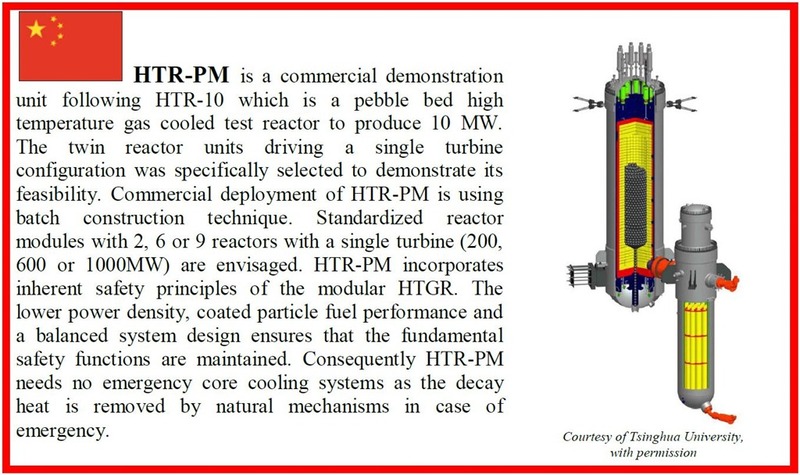 TRISO fuels are fabricated by BWX Technologies Nuclear Operations Group (Lynchburg, Virginia) that can be formed for use in both the prismatic-block version of the HTGR and the pebble-bed HTGR, depending on the selected reactor design. (Bloomberg) Urenco Ltd., the world’s second-biggest maker of atomic fuel, is is developing a radically smaller nuclear reactors in order to boost demand for its services. The company is developing, in conjunction with Amec Foster Wheeler Plc, a generation of small, modular reactors called “U-Batteries,” CEO Thomas Haeberle told the Bloomberg wire service the firm’s design is expected to be able to generate 10MW of electrical power or for use as process heat. The U-Battery is being developed for small towns and industries operating in areas beyond the reach of large nuclear plants. While a typical reactor generating a 1,000 MW of electrical power would need pervasive grid access and dense populations for profitability, a U-Battery could make economic sense even in more remote areas with less concentrated economic activity. Central to the U-Battery design is its so-called TRISO fuel, a three-layered sphere with a uranium kernel that can withstand very high operating temperatures according to the web site prospectus. 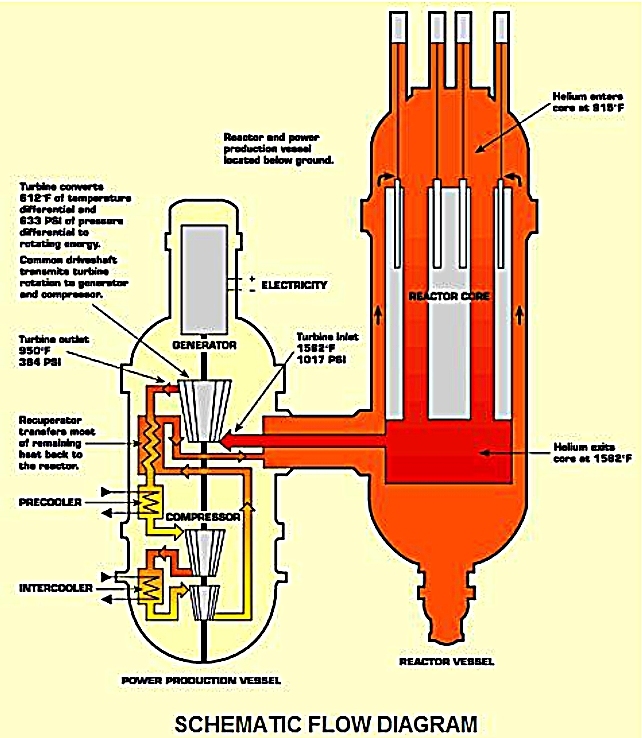 The reactor uses helium to move heat via a primary loop from the reactor directly to a turbine or to secondary loop in a steam generator. The company is in talks about conducting trials on a prototype in Canada and Poland and is about to start the licensing process, the CEO said. The construction company Laing O’Rourke Plc as well as shipbuilder Cammell Laird Holdings Plc are also part of the group developing U-battery. (Financial Mail) South Africa a new initiative to revive the Pebble Bed Modular Reactor project that was abandoned in 2010 after years of development. The reasons for halting the project were given as cost overruns, missed deadlines and lack of an anchor customer. Problems were also identified with the efficiency of the reactor for baseload electrical power. Applications for process heat were not fully explored by the R&D program. The intellectual property of the PBMR remained with Eskom, which is revisiting it. Brian Molefe, CEO of Eskom, has asked his team to look again at the PBMR and the new plan is to develop a reactor that is simpler and more efficient than the original design. A small-scale nuclear reactor would fit into a grid mix that includes the intermittency of renewable power. He says the funding for this research is limited and the project is not yet at the stage where he can give a cost estimate for design, proof of concept and commercialization. (Deutsche Welle) President Jacob Zuma’s recent cabinet reshuffle removed key political figures from government who are opposed to proposals to build more nuclear reactors. These are full size reactors based on conventional light water technologies. The political move also set financial markets on edge and put the South African currency into a new tailspin. South Africa is now being gripped by fresh controversy over plans for expanding its nuclear power program. The new finance minister Malusi Gigaba denied that any deal had been inked with Rosatom for 9.6 GW of nuclear power. The Rosatom offer is for eight light water type VVER 1200 MW units. Gigaba’s predecessor as finance minister, Pravin Gordan, who was fired last week, was a strong opponent of the Russian proposal and the development of nuclear energy in general, largely over cost issues. The new nuclear reactors are expected to cost more than (65 billion euros, $73 billion). Gordan repeatedly warned of the high costs of nuclear projects believing they would plunge South Africa deeper into debt. The ministers for energy and for public works in the old cabinet also lost their jobs in the recent purge of political appointees. Hartmut Winkler, professor of Physics at the University of Johannesburg, told DW that the change in finance ministers is politically motivated. “Zuma fired Gordan so that he could replace him with someone who wouldn’t raise any major objections to the planned nuclear deal,” he said. Rosatom announced that it had sealed a “strategic partnership” with South Africa in 2014 when President Jacob Zuma visited his Russian counterpart Vladmir Putin in the Kremlin. The plan was to build eight nuclear reactors in South Africa with a combined output of 9.6 GW by 2030. News media in South Africa have reported connections between President Zuma and family members of his close supporters. Critics of the nuclear deal claim that the huge project will provide Zuma with a nearly bottomless bucket of patronage for his supporters. DW reported that its research indicated that Rosatom is the favorite to secure the deal. However, Nesca, the state-run nuclear energy corporation, has denied this allegation. The newspaper did not reveal its sources nor publish any documents to back up its claim. South Africa was in the process of collecting bids ESKOM, the state owned public utility said in a written statement. Companies could submit bids until April 28. A number of companies have ready promised do this including major suppliers of nuclear technology from China, France, Russia and South Korea. Eskom would send the paperwork to the finance ministry and the cabinet and was hoping approval for the project before the end of the year. ESKOM has released and canceled tenders for nuclear energy in the past with the cancellations attributed to the lack of financing for the project. South Africa’s economy is in trouble and the currency has been devalued. It’s bond rating now has a “junk” rating and some investment analysts say that downward move is long overdue. The ability of the nation to pay for a $73 billion energy program is beyond its reach even with 50% financing from a vendor taking an equity stake in the project. South Africa’s ruling party on April 9 said the government will have to re-think its costly and highly contentious nuclear expansion program following last week’s relegation of the country’s creditworthiness to junk. Within days of each other, two of the world’s major rating agencies, Fitch and Standard & Poor’s, downgraded South African sovereign debt to junk status after President Jacob Zuma’s dramatic ministerial shake-up that saw respected finance minister Pravin Gordhan axed. In 2010 South Africa formulated plans to expand its nuclear power capacity, plans estimated to cost around R1-trillion ($73-billion). The politics of the structure of South Africa’s economy is one of the things that keeps the government in a state of near perpetual turmoil. “No-one can properly define this term” Peter Attard-Montalto, emerging markets economist at Nomura, told CNBC. He added that it was likely to imply initiatives such as faster land redistribution, forced share ownership changes and higher wealth taxes. The goal is to address the fact that around 10% of the population – a largely white cohort – still own at least 90 to 95% of all wealth, according to widely cited research from REDI published last June. The report also made allegations of widespread corruption by President Zuma and his supporters. It isn’t clear whether Gigaba plans for the government to seize assets from the wealthy, but even if he does, it may cripple the very industries that would be the customers for the electricity that would come from the planned nuclear reactor program.